With their title Thunder Cash, Ainsworth takes you to a proper place – a casino! Set within a casino with roulette and poker tables and physical slot machines serving as a backdrop, the 2016 release is a real treat for all slot enthusiasts. We have to admit that the game looks impressive boasting more advanced graphics than previous titles from the developer’s production we have reviewed. When it comes to layout, it is a typical Ainsworth affair with 5 reels and 20 adjustable paylines. The biggest attraction of the game is its free spins feature with sticky Wilds helping you win larger payouts. Enter the virtual brick-and-mortar casino with Thunder Cash and win up to 20,000 coins in a single spin. The slot combines traditional symbols like sevens and diamonds with theme-related icons represented by casino chips and dice. They all make up the higher ends of the paytable while playing card symbols rendered to look a bit classy and match the theme of the game pay low-value prizes. The lightning bolt represents Wild whereas the game’s logo stands for Scatter. 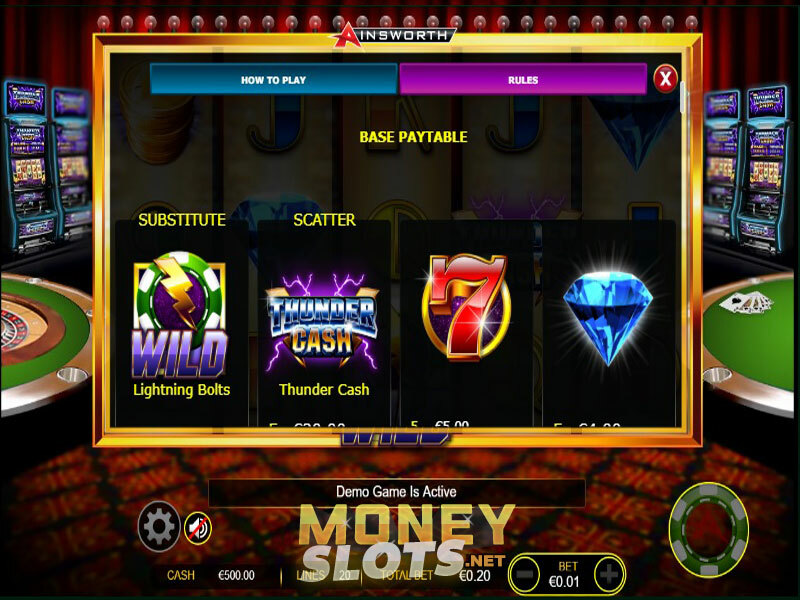 Thunder Cash is played on a standard 5x3 layout and offers up to 20 paylines. A betting range is wide to fit both beginners and high-rollers starting at $0.20 and going all the way up to $2,000 per spin at all paylines active. Just select a preferred coin value and you are good to go. Although you can decrease the number of active paylines, we recommend you keep them all active to secure the best odds of winning. If you don’t feel like spinning the reels manually, go for up to 100 automatic spins and enjoy the gameplay. Symbols pay left to right when at least three of a kind land on an active payline in succession. Only lucky sevens pay when you land at least two of a kind. 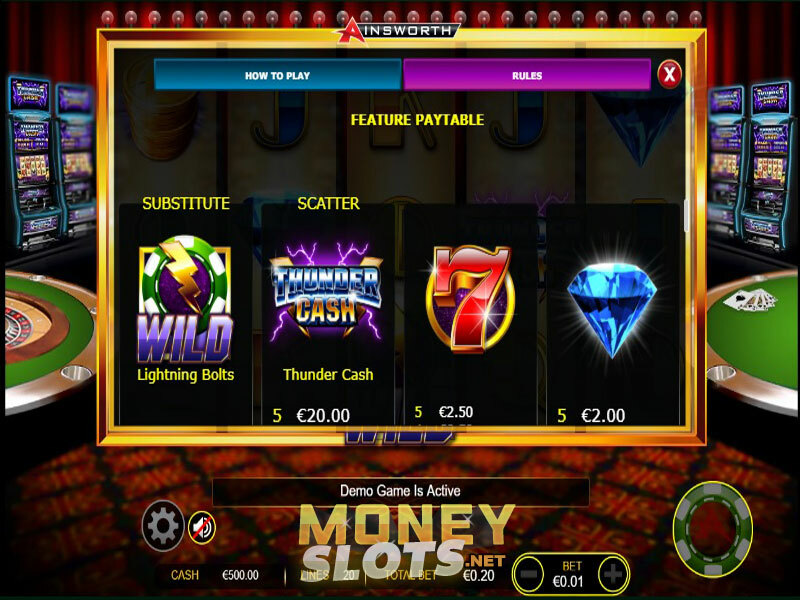 Lightning Bolt Wild appears on the reels 2, 3 and 4 only to complete your winning combinations by replacing all regular symbols. Look out for 3 and more Thunder Cash Scatters that trigger 8 free spins. Any Wild that hits the reels within the feature stays locked in its position until the end of free games. You can retrigger the feature and win 5 additional free spins. Keep in mind that a different paytable is in play during free spins and that if more than 5 Scatters appear on the reels, they pay the same amount as 5 Scatters. If you are looking for some real casino action to enjoy on the go, the good news is that Ainsworth title is fully optimized for mobile play. You can enjoy it anytime anyplace for a chance to hit up to 20,000 coins in a single spin.